U.S. Vice President says all options are on the table following chemical attack in Syria. 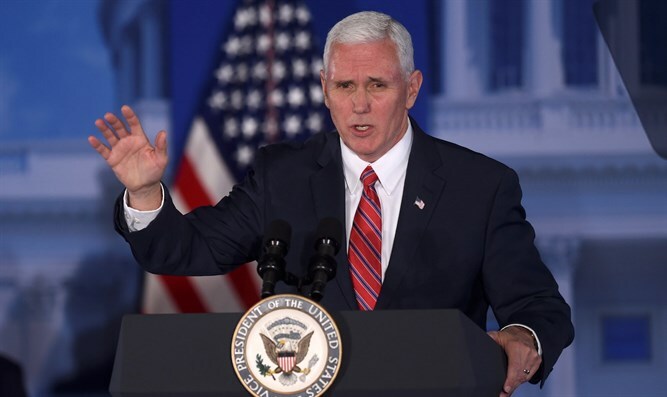 U.S. Vice President Mike Pence said on Wednesday that it was time for Russia to ensure that Syria's chemical weapons are removed. Speaking on Fox News, Pence said the time had come for Moscow to "keep the word that they made to see to the elimination of chemical weapons so that they no longer threaten the people in that country." Asked about the response to the chemical weapons attack in Idlib, Pence replied, “Let me be clear, all options are on the table," without elaborating. Russia and the United States brokered the 2013 deal under which Syria agreed to hand over its chemical stockpile to the Organization for the Prohibition of Chemical Weapons (OPCW) for destruction. Despite the deal, the OPCW has determined that chemical weapons such as chlorine gas have been "systematically and repeatedly" used as a weapon in Syria. Officials in the United States believe sarin gas was used in Tuesday's attack in the Idlib province. Earlier on Wednesday, President Donald Trump accused Syrian President Bashar Al-Assad's government of going "beyond a red line" with the attack and said his attitude toward Syria and Assad had changed, but gave no indication of how he would respond. Trump said the attack "crosses many, many lines", according to Reuters. "I will tell you, what happened yesterday is unacceptable to me," Trump told reporters at a news conference with Jordan's King Abdullah. Russia has claimed that Syrian rebels were to blame for the attack, but officials in Washington rejected that claim. Moscow claimed the poison gas belonged to rebels and had leaked from an insurgent weapons depot hit by Syrian bombs. A senior White House official, speaking on condition of anonymity, said on Wednesday the Russian explanation was not credible. "We don't believe it," the official told Reuters.